Our History | United Properties, Inc.
United Properties, Inc. traces its heritage to the early 1930s, when Malcolm G. Long and Thelma Gibbs Long first moved to Billings from Maine. An engineer, entrepreneur and innovator, Malcolm’s businesses expanded over four decades across Montana and northern Wyoming. Today, Malcolm and Thelma’s three children and their spouses continue this tradition. Malcolm became a Montana-based engineer and entrepreneur whose business activities included construction materials supply, heavy construction and coal mining. In 1941, Malcolm established Long Construction Company which he expanded over four decades across Montana and northern Wyoming. An innovator, in the late 1950s Malcolm founded Prestress Inc., which was instrumental in the introduction of an advanced suspension technology that was key to developing our modern Interstate Highway System. In the 1980s, Malcolm’s son, Joel Twining Long, expanded the family business into commercial real estate. Many people contributed to the success of United Industry, Inc., including Malcolm and Thelma’s three children and their spouses: Cynthia Long and Milan Foster, Connie Long and Dean Studer and Joel Long and his wife, Andrea. 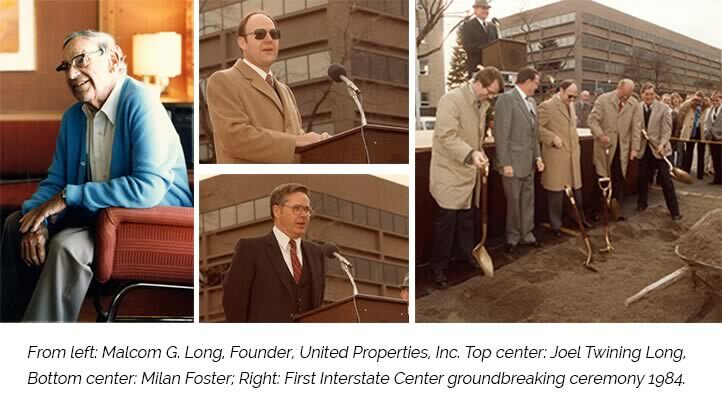 Today, the Foster, Studer and Long families continue this tradition as the joint owners of United Properties, Inc.